These car diffusers come in pretty glass cube diffuser bottles, with black metal encasing the wood top which are carefully filled with 7ml of our scented oil. The wooden lid acts as diffuser reeds in your home reed diffuser and they come with a black/silver cord with a silver bead, so they look good too. Choose your favourite scent, selecting from the list - enjoy! 1. Never fiddle with the car diffuser when driving. 2. Ensure that it is securely fastened behind your rear-view mirror & that your view is unobstructed. 2. Keep away from children & pets and obviously do not drink/ingest! 3. Gently tip the diffuser upside down for a second or two to allow the scent to permeate the wood (this can be repeated whenever you want to boost the scent throw too). Don't overdo it- you'll waste the fragrance oil! 4. 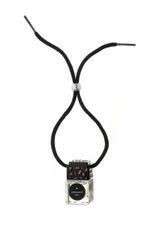 Attach over your rear view mirror and secure using the silver metal bead on the rope.